Scientists say green flashes come in two common forms; these were described by James Prescott Joule in a letter to the Manchester Literary and Philosophical Society in 1869. First, he noted that “at the moment of the departure of the sun below the horizon, the last glimpse is coloured bluish green.” This “last glimpse” flash is associated with the inferior mirage, familiar on asphalt roads on sunny days. It is best seen from a few meters above sea level, and becomes compressed to a thin line at the horizon when seen from considerable heights. This second form of flash is associated with a mock mirage, which is caused by a thermal inversion below eye level; so it is mainly seen from elevated positions. As light passes from the vacuum of space into the atmosphere, which acts like a prism, it slows down and causes the light to bend or refract towards the surface of the earth. The white from the sun is made up of many different colors of light, all of which have a different wavelength. The wavelength (or color) of light affects how much it is refracted on entering the atmosphere, with red light refracted the most and blue least (as in rainbows). Imagine the image of the sun as being made up of red, green and blue images. Light from the 'red image' will be refracted more than that from the green and blue. So, the 'red image' will appear lower than the green, which will similarly appear lower than the blue. At sunset, or sunrise, this effect is intensified as light travels through a slightly thicker atmosphere. As the sun disappears below the horizon, the 'red image' will disappear first and the blue last. The atmosphere causes blue light to be scattered more than red or green - the reason why the sky appears blue - so light from the 'green image' … the 'green flash' … will normally be the last thing you see as the sun disappears below the horizon. On very rare occasions, the atmosphere may be clear enough to allow some of the blue light to reach us and cause a 'blue flash' as the sun sets. The phenomenon lasts only a fraction of a second, so unless you know where to look and when, the chances of seeing one are very slim. Viewing conditions need to be just right, too. Watching the sun set over an ocean horizon on a clear evening creates optimal viewing conditions. Your line of sight should be almost parallel to the horizon and you need to really concentrate at the top edge of the sun as it is about 98% set. If you are lucky, you will see the top edge of the sun turn green for a brief moment, before disappearing below the horizon. 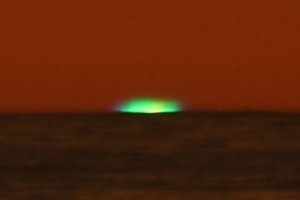 Jules Verne's 1882 novel "Le Rayon Vert" (The Green Ray) popularized the green flash, described as "a green which no artist could ever obtain on his palette, a green of which neither the varied tints of vegetation nor the shades of the most limpid sea could ever produce the like! If there is a green in Paradise, it cannot be but of this shade, which most surely is the true green of Hope". Be careful. Even with the sun low in the sky, concentrated observation with the naked eye can cause damage to your eyesight. In addition, I have added other images in a folder of like kind in the Photos section on my Facebook page.